The controversial plans for the Institute of physics building at 4 Balfe Street go to planning committee for decision tonight (1900 at Town Hall on Upper St). Cabe Franklin who lives next door to the proposed building has found some substantial holes in the IoP’s case in these slides. As Cabe set out and also in my view the IoP’s light data is wrong, they use misleading photographs and have some ludicrous numbers on economic benefits apparently based upon a 1994 study of an american community hospital. And describe Cally Road retail as ‘derelict’ – the only retail properties derelict are those this site has been sitting upon for years. Worryingly despite all this wonky analysis the council case officer is recommending that the committee approves the proposal – which in my view effectively flushes the conservation area down the loo – with barely any conditions. 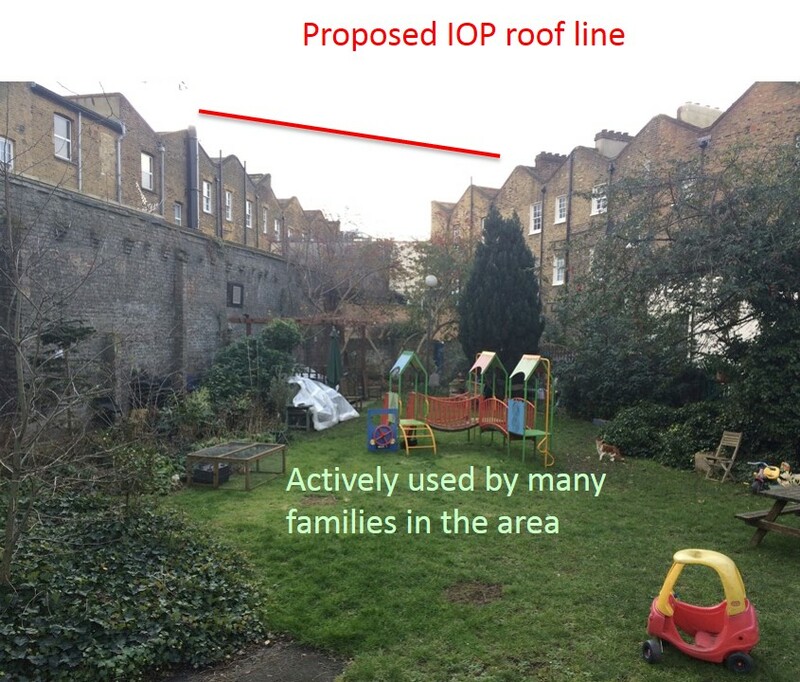 Setting this precedent in the Keystone Crescent conservation area (busting through roof lines, unsympathetic materials, breaking of planning policies) will have a knock on effect for all Islington’s conservation areas as developers can just cite precedent. Remarkably the proposed S106 agreement seems to make no allowance for local compensation for loss of local amenity. It’s a very poor piece of public administration, in my view. This entry was posted in Big developments, Planning, Licensing and Regulation and tagged @physicsnews, balfe street, iop, planning. Bookmark the permalink. To say this proposal is unsympathetic to the Conservation Area is an understatement. It seems to go out of its way to destroy or devalue the existing building and sticks two fingers up to its neighbours. And it would be a terrible precedent for future developments. I have lived off York Way for 10yrs and when the 1st building of the new development (Rubicon Court) went up the sun now disappears behind it from 1730. This means in Summer I lose 5hrs of light and it seems like it is near dusk on the street below. This also affects the temperature inside my flat and also since I have a living room/kitchen combined with only a window at the end of the living room, I have to turn a light on in the flat in the evenings. This doesn’t just affect my flat but all the flats in my block as well as the blocks behind/that come in the way since it is the 2nd tallest building in the area now. It would have been some compensation if it was a beautiful building but its a real abortion and looks awful and flatpack – and indeed everyone that comes to my flat comments how ugly it is. Naturally, it’s designed for affordable housing, so now that those tenants get amazing views of the city from the balconies, me and my neighbours are left in cold and not able to experience the summer evenings that we used to. I often joke to people that that building needs a plane flying into it lol. I had never been in touch with what was going on in the new development but I didn’t think it would affect me negatively this much. Don’t let them take away your view or light as you will have to live with the dissatisfaction caused for the rest of your lives living there. The fact people in the new building will be able to see into your gardens is a huge violation of privacy and must be addressed. It will make you feel like you can’t use your homes as you once did which is a horrible feeling. I cannot enjoy my summer evenings anymore. We fought and fought but the planning committee were not able to resist the idea of something shiny they could point to in the next election year. The Councillors who voted to cut the Cally Road retail resurgence off at the knees, and destroy a Conservation Area that had been preserved for 200 years – not to mention the thing that least concerned them, which was our home losing up to 60% of our year-round sunlight and 100% of our winter sunlight, in clear contravention of the BRE guidelines for new construction – are: Martin Klute, Jenny Kay, Robert Khan, Tim Nicholls and Angela Picknell. Their toothless defence of their own policies should be remembered any time anyone in the borough is considering who should be in charge. And for good measure, remember the name of the planning officer, Nathaniel Baker. I emailed him the slides above well before the meeting – he wrote back and said he would distribute them to the committee – and then when the meeting commenced, he not only had not sent the slides out, but he told the committee that he had received ‘a new representation in favour of the proposal.’ Call it a lie or call it an inaccuracy – either way, it appears to be the standard by which this group operates – which means it is the standard by which we are being governed. I have checked and received confirmation that the slides were circulated to committee members ahead of the meeting by Jackie Tunstall, the committee clerk. “This application was a very tricky balancing act. On the face of it it seemed a very worthy proposition, but at the same time, a cynic might suggest that they are offering rather nebulous ‘community benefits’ in order to get round our policies in a way reminiscent of some of the hotel applications we have seen recently. I was mindful of this when I reviewed the application at the agenda-setting meeting, and asked that the educational programme be captured in a S106 agreement to ensure it would be delivered. When the application came to committee the officer’s report was clear that the proposal represented harm to the conservation area, and it also emerged that the applicants had failed to comply with our policy on 2 year’s marketing evidence, which was making it harder for us to find in favour of it, although when questioned on why they had failed to do this, their response was along the lines of, “when we bought the building we didn’t market it because we wanted it for our own use”, which you can understand, but which doesn’t answer the policy issue. When the applicants spoke, they presented quite a long list of community benefits, including regeneration, employment, visitors, education, promotion of science and technology, public outreach, and also, interestingly, that they proposed to include space for SME physics-related startups within the building, something I hadn’t heard previously, and which caught my attention. The committee seemed unsure what view to take of the balance between the acknowledged harm that would be caused by the scheme, and the possible benefits it would bring, which seemed to need to be taken somewhat on trust. I therefore suggested that the benefits we were particularly interested in should all be firmly bolted down in the S106 agreement. We then agreed that we would amend the S106 agreement to require the education and outreach programme to be provided in perpetuity, that schools outreach be added to the programme, and that the provision of the SME units be secured by identifying the areas for this use, affordable rents for the spaces, and that they also be provided in perpetuity, the final wording of the S106 to be agreed in consultation with the chair, and that the permission would not be finally granted until the enhanced S106 had been satisfactorily concluded. On this basis the committee was minded to resolve to approve. I should also add that when the scheme was considered by the committee, there were a large number of people who attended for the item, but only objectors were allowed to speak. As far as the Conservation Area is concerned, it is stated that the decision regarding the IOP will not set a precedent. This will be tested when future applications come along. I support Conservation Areas and in particular the Keystone Crescent and Kings Cross CAs, since they have helped develop the area in a positive way. Not, strictly, true. My wife and I were granted three minutes each to speak to draw attention to the harms to the conservation area, the inaccuracies in the slides above, and the fact that the building would take up to 60% of our annual sunlight from the back of our house – well in excess of the BRE guidelines. The proponents of the project then had six minutes to speak. The proponents of the project were then further engaged in extensive Q&A by the councillors where they continued, not surprisingly, to speak in favour of the project. The planning officer, also a proponent of the project, was able to speak freely. As objectors to the project, we were not permitted to speak again, even when the proponents of the project continued to rely on major inaccuracies, misdirections, and mischaracterisations. Counsellor Klute began the session by saying ‘This is a quasi judicial proceeding’, but I was previously unaware of the use of ‘quasi’ to mean ‘not at all’. A judicial proceeding would allow each side of an issue equal time, in pursuit of the truth, or at least of a balanced set of inputs. Given how we were treated – as interlopers who barely had a right to contribute an opinion for 180 seconds on something that will have a huge impact on our lives – it is frankly offensive that he would say he only allowed objectors to speak. I ended my interaction even more strongly convinced that the IOP are not the kind of organisation we should be inviting into the borough, and surprisingly disappointed in the effectiveness of the Council as a fair and deliberative body. Or, in plainer language – I had thought we might lose, but I didn’t expect everyone to be such jerks about it.